India wins SAFF U-15 final ! India beat Bangladesh in the final of the 2018 SAFF U-15 Women's Championship held in Bhutan, a revenge after last year win for Bangladesh. The Indians dominated the first part of the game but scored only once. Enough to lift the trophy ! The 2018 SAFF U-15 Women's Championship was the second edition of the SAFF U-15 Women's Championship, an international football competition for women's under-15 national teams organized by SAFF. The tournament was hosted by Bhutan at Changlimithang Stadium. Six teams from the region took part, with India winning the title in the end, beating Bangladesh in the final 1-0. This replay of last year final took time before choosing its winner. Before the tournament, Shaheda Akter Ripa, bangladeshi player, had a very clear objective, as she explained on the BFF website : "My target is to make our team to win in all the matches and finish as champions like our sisters have done last year in Dhaka", she said. But the Indians never let their rivals take this chance. Very dominant in the first half, they finally scored at 66', on a corner which Sunita Munda converted with a superb volley. The Bangladeshis then pushed in the last 15 minutes, even hitting the cross bar and the post twice, but the luck was not on their side this time. Quite logically in the end, the Indians won the game and lifted the trophy. Earlier in the tournament, both teams showed their strength to get to the final. In Group A, India did not have to suffer to finish first, with an impressive 12-0 against Sri Lanka and a narrow victory against Bhutan (1-0). Silky Devi, whose first name speaks for itself, impressed with four goals scored, including a hat-trick against Sri Lanka. In Group B, the path was quite similar for Bangladesh : a huge 14-0 versus Pakistan and an easy 3-0 against Nepal. 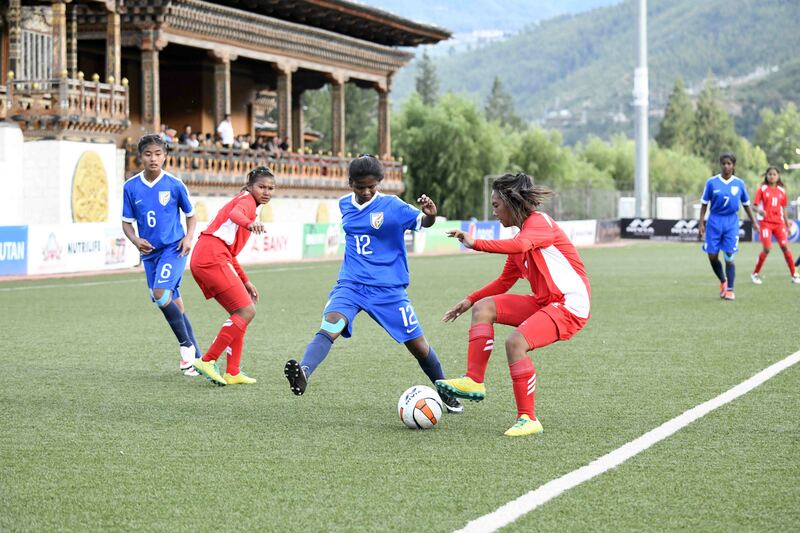 Shamsunnahai scored four times, while Toshura Khatun and Sadeja Khatun compiled three goals each. But probably the best goal award should be attributed to Maria Manda against Pakistan, what a strike ! In the semis, India had more difficulties to beat Nepal. Despite opening the score, the Indians were unable to increase the mark and the Nepalese finally came back. And it’s only around the hour that, benefitting from a big mistake of the Nepalese goalie, they finally took the advantage. Meanwhile, the job was much easier for Bangladesh against Bhutan, despite the original ambitions of the locals. "We have the home ground and home crowd advantage in this edition. We had been preparing for a long time. We expect to be the champions this time", had declared the Bhutan Media officer, Phuntsho Wangdi, before the tournament. But things never went the right way for the hosts during this game. The Bangladeshis scored their first after 18 minutes and never stopped hitting the score board. Among the five goals, this one from Anuching Mogini was quite impressive. And then, the final between the two best teams of the tournament proved very unpredictable, with only one goal making the difference, Sunita Munda becoming a hero for the young Indian team.